Use three ingredients to make Easy Parmesan-Garlic Chicken Skewers. Parmesan, Italian dressing and garlic powder are the secret to these chicken skewers. Mix first 3 ingredients in shallow dish. Thread chicken strips onto wooden skewers; moisten lightly with water. Dip, 1 at a time, in cheese mixture, turning to evenly coat each strip. Spray large sheet of foil with cooking spray; place foil on grill grate. 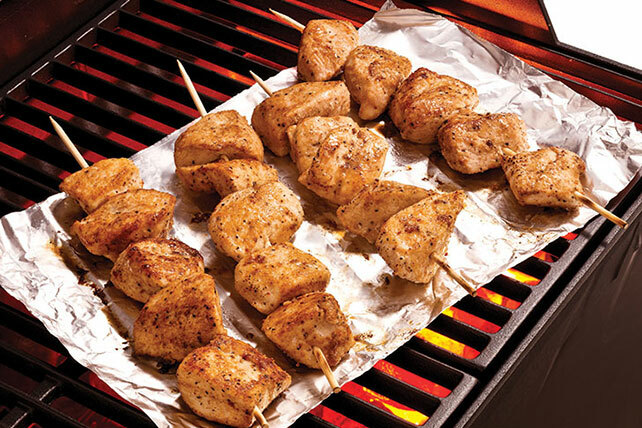 Place skewers on foil. Grill 12 to 15 min. or until done, turning frequently. Prepare as directed, threading your favorite fresh vegetables, such as mushrooms, cherry tomatoes and/or cut-up bell peppers or onions, onto skewers alternately with the chicken.